Dual fixed displacement pump with cover switch. Load-independent flow division (LUDV) for all work functions and travel drive. Simultaneous independent control of 3 movements. Spacious, sound-insulated full-vision steel cab with two equally large doors. TOPS certified. Safety glass windows, thermo windows tinted in green. Skylight thermo window. Front window supported by pneumatic springs, lockable in place for ventilation and slideable under cab roof. Windshield washer system. Glove box. Instrument panel to the right of the operator’s seat with visual and audible warning device. Left-hand outside rear-view mirror. Cab heating with windshield defroster through hot water heat exchange with 2-stage fan. Fabric-covered operator’s seat with armrests, height, tilt and weight adjustments, lap belt. 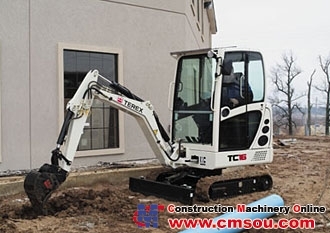 Copyright Notice © 2002-2019 cmsou.com Construction Machinery Online. All rights reserved.